Is Rwanda's Hero Becoming Its Oppressor? 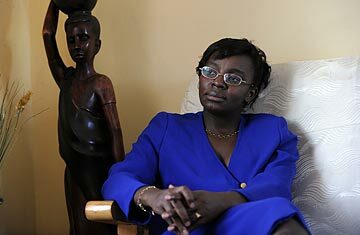 Rwandan United Democratic Forces Chairperson Victoire Ingabire Umuhoza poses at her home, on April 7, 2010 in Kigali. Ingabire was arrested on April 21, 2010 for "collaborating with a terrorist organisation" and other genocide-related accusations, an official said. President Paul Kagame of Rwanda is often lauded around the world for pulling his country out of the mire of genocide 16 years ago. But Rwandan opposition leaders, diplomats and rights activists fear Kagame is now cracking down on his opponents ahead of national elections in August. They cite two prominent examples: Charles Kabonero, a Rwandan newspaper editor, sits in exile in Uganda, doing internships with civil society groups; and Victoire Ingabire, an opposition politician, sits in a different sort of exile, unable to leave Rwanda's capital Kigali, until a trial against her ends. The banning of Kabonero's Umuseso newspaper earlier this month and Ingabire's arrest on Wednesday were only the most recent in a series of actions  including a military shakeup, arrests and the decision by many ambassadors, opposition leaders and rights activists to go into exile  that have western diplomats and regional experts worried that Kagame may be purging supposed enemies and cutting out potential threats before the vote. "Things are not good," Kabonero, whose Umuseso was shut down for six months on April 13, tells TIME. "We are seeing a situation where the government is doing everything it can to instill fear, and to make sure that the opposition doesn't have the opportunity to access the public." Rwanda has come an incredibly long way since the genocide, which saw Hutus slaughter 800,000 Tutsis and moderate Hutus in just three months. But opposition figures say they believe Kagame is now preying on fears of another genocide to crush the opposition. He won 95% of the vote in 2003 elections that were seen as flawed. They point to the "genocide ideology" law that is meant to keep people from fanning ethnic hatred, but which critics say has been used to stifle dissent. Kagame is a conundrum to western diplomats, who say that despite his flaws, Rwanda's president has fought to control corruption and has expanded the economy. "This is a country that has a vision, this is a country that has made miraculous progress since 1994," said a western official in Rwanda, who spoke on condition of anonymity because he was not authorized to speak with the press. "On the other hand, there's the issue of democracy. And there it gets a lot more complicated." Kagame's attitude toward dissent was thrust into the spotlight when Victoire Ingabire, leader of the opposition United Democratic Forces, was arrested Wednesday, after returning to the country in January. She was charged with associating with a terrorist group and propagating "genocide ideology" for comments she made at a genocide memorial event in which she said Hutu victims of the genocide must also not be forgotten. Ingabire said she is innocent and simply wants to start a dialogue that has been stifled for years. The government and some western officials, speaking to TIME anonymously, fear she is essentially using ethnicity to win support among fellow Hutus. Her party has not been allowed to register and it seems unlikely so far that she will be allowed to run for the presidency. "What we say is that the government will use the genocide for political ends," Ingabire tells TIME by phone from Rwanda. "If we say 'Hutus were also victims,' for the government, this is genocide ideology. There was a genocide but there were also other crimes in Rwanda, there were crimes against humanity, and we have to remember all the victims of this tragedy." Similar accusations of stirring hatred and inciting violence were leveled against the two newspapers that were banned earlier this month. Kabonero's Umuseso and another opposition newspaper Umuvugizi had been critical of the government in the past. The Media High Council, a nominally independent body, said they had insulted Kagame, incited insubordination among the police and army, and stirred fear. The council's executive secretary, Patrice Mulama, says that in Rwanda  where pro-Hutu radio played such a huge role in fanning the genocide  the media must be especially careful not to provoke tension. "We didn't do this because we wanted to suppress media freedom but we did it because freedom comes with responsibility," Mulama tells TIME. "We want to ensure that there is media freedom but that the people who practice journalism do it responsibly. There is no freedom that can be accepted if it infringes on the rights of the others or where it endangers the safety of citizens and incites the public to violence." The latest sign of the crackdown came late Friday. That was when the New York-based rights group Human Rights Watch announced that the Rwandan government had denied a work permit to its new researcher there, Carina Tertsakian. She was on a three-month visa that expires Saturday. According to Human Rights Watch, the government said there were "anomalies" in Tertsakian's application, a claim the group denies. It claims that the decision is part of a government strategy of targeting individuals rather than risking international condemnation by kicking out the rights watchdog itself. "It's a blow for Human Rights Watch and is part of a broader pattern of what's going on Rwanda," says Georgette Gagnon, Africa Director at Human Rights Watch. "The Government has chosen to go after an individual because they think it is easier than going after the organization and is less likely to draw attention from the international community. Human Rights Watch will appeal the decision and will continue working on human rights in Rwanda." See Paul Kagme in 2009 TIME 100. Watch a video on Rwanda's cinema under the stars.